Harley Quinn takes over DC’s variant covers for February 2015, and CBR unveils five covers including The Flash #39 by Amanda Conner and Paul Mounts. This entry was posted in Covers and tagged Amanda Connor, Harley Quinn, Paul Mounts, Variant Covers on November 14, 2014 by Kelson. As a rule I dislike characters who hurt people, so not overly fond of Harley. 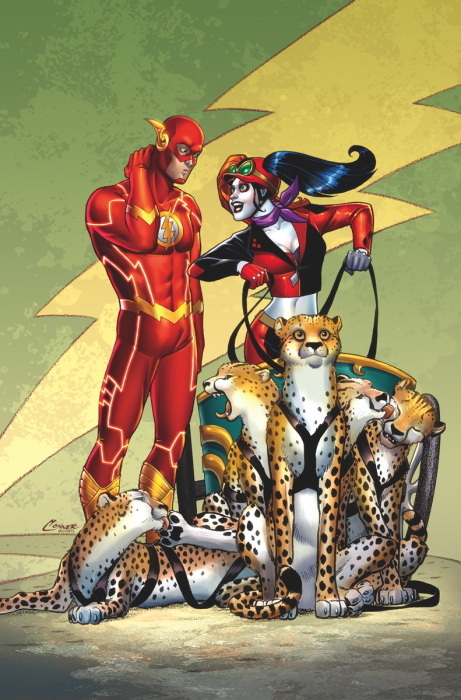 However, love the depiction of the cheetahs and Barry’s bewilderment. Harley Quinn is on all variant covers? Here is why I don’t like it…I hate covers which show stuff that doesn’t happen in the book. If she is in all the issues then sure, but I hate when there is action on the cover which never happens. Scott, I generally agree but then that’s why it’s just a Variant cover. There is still the normal cover for the rest of us. I’m not a fan of variant covers either but I know a lot of people are so I figure let them have their fun. Mostly, I think it’s collectors go for this stuff. That said, I like the upcoming Darwyn Cooke variants (first time I fell for Variant covers) because, well DARWYN COOKE art!!! That said, the (hilarious but obviously futile) Cheetah chariot makes for a clever idea for a pin-up piece and Amanda Conner’s work in the expressions is brilliant. Even the cheetah’s faces are nicely done.